GMC has just announced a new package for the new Sierra 1500 AT4 to help you get off-road a little faster than before. 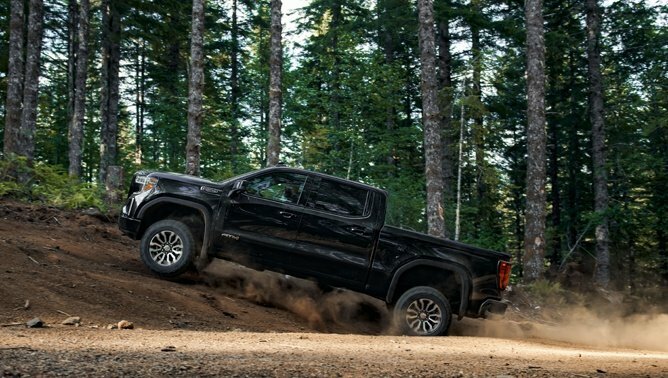 An all-new Off-Road Performance Package that adds power to the biggest of the Sierra’s V8s. The base AT4 comes with the 5.3L V8 that puts out 355 hp. But the Off-Road Performance Package is only for the optional 6.2L V8. That engine starts out with 420 hp and 460 lb-ft of torque. With help from a new cat-back exhaust and an air intake, the Performance Pack offers up 435 hp and 469 lb-ft of torque. That’s 15 hp and 9 lb-ft more than standard. Shifting is handled by a 10-speed automatic. Also included in the Off-Road Performance Package are 18-inch alloys with Goodyear Wrangler DuraTrac off-road tires in 275/65R18 size. On top of that, the AT4 comes with a host of off-road kit like a two-inch lift and Rancho shocks. It also has a locking rear differential and underbody skid plates for protection on the trail. The lightweight GMC carbon fiber box is optional. The AT4 Off-Road Performance Package is available now, with an MSRP of $4,940. Though that price includes the 6.2L V8 and 10-speed, which are $2,495 if ordered alone.